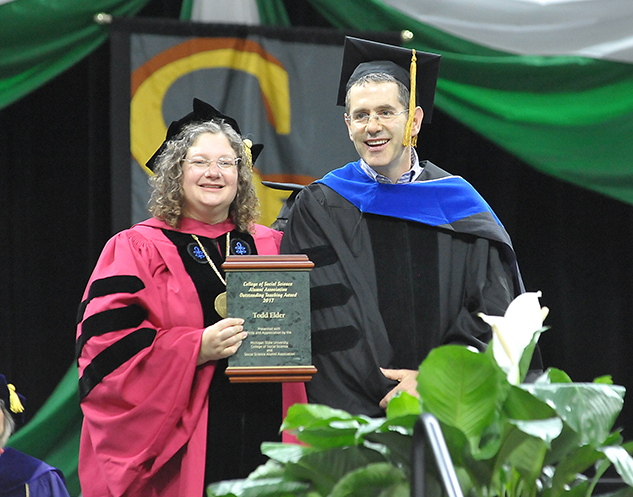 Dean Rachel Croson presents the College of Social Science Alumni Outstanding Teaching Award to Todd Elder at the Spring 2017 Commencement Ceremony. Todd Elder, Associate Professor of Economics, was chosen as the winner of the 2017 College of Social Science Alumni Outstanding Teaching Award. This came as no surprise to his colleagues on the economics faculty, as Todd has established a reputation as one of the best teachers in a department known for its commitment to quality teaching. Todd came to MSU in 2006, and since then has taught both undergraduates and Ph.D. students. One of the undergraduate courses he regularly teaches, Introduction to Econometrics, is required for all economics majors and is recognized to be one of the most challenging courses in economics. It has become well known among students, however, that when you take this course Prof. Elder is the instructor you want to have: his sections fill up almost immediately after they are opened. It is not because Todd is an easy instructor, but because he is an excellent teacher of difficult subject matter. Todd is an asset to our graduate program as well, as a teacher in our graduate sequence on labor economics who has been a member of over 20 dissertation committees. Todd’s graduate teaching reflects a belief that graduate instruction is not only about teaching higher level theory and econometrics but also about contributing to the professional development of future scholars, through identifying the actions and attitudes necessary to becoming a successful economist, and helping Ph.D. students to begin to see themselves as “peers in the profession”. We are fortunate to have Todd as a part of the economics department, and pleased that his teaching ability and contributions have been formally recognized by the College of Social Sciences.